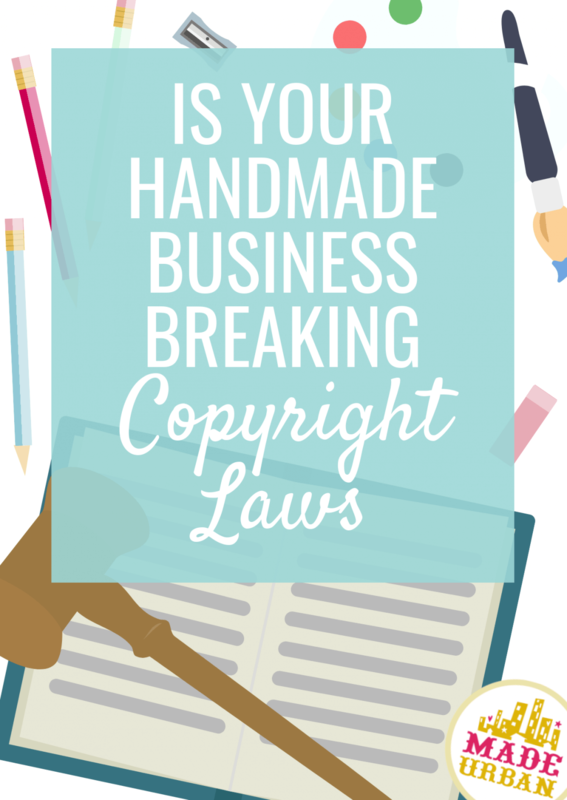 Is your Handmade Business Breaking Copyright Laws? Copyright infringement is a complicated subject. There’s a ton of info out there and the only way to be sure you’re getting correct information is to talk to a lawyer who is knowledgeable on copyright laws in your area. Copyright infringement is often used when talking about trademark infringement…which is what a lot of handmade business owners and Etsy sellers do when they sell Disney, Hello Kitty or Star Wars items. Copyright falls under Intellectual Property, which refers creations of the mind such as; words, designs, books, music, processes, machines, etc. Trademarks, copyrights and patents protect Intellectual Property. You are not required by law to register a trademark, copyright or patent, but you are required, by law, not to infringe on someone else’s intellectual property. Registering a trademark for your logo or designs, a copyright for your written work, or a patent for your invention, provides extra protection and makes it easier to prove ownership and take legal action (if you choose). Unfortunately, big companies like Old Navy, Zara and Forever 21 constantly rip off independent designers work, just check out this article. But what’s more common, is handmade business owners infringing on big companies’ intellectual property. You’ll see crocheted Disney characters all over Etsy, products with NFL logos on them, items using Star Wars themed fabric, etc. Just because another business owner is selling these items does not mean it’s legal to do so. You must purchase a licensing agreement to sell products that resemble Disney characters or that use Disney-themed fabric. The company that created the fabric would have (or should have) purchased the licensing agreement from Disney to do so but that agreement does not transfer to you and you’re likely only permitted to use it for personal use. I go into some more detail about intellectual property, and other important laws that pertain to handmade businesses in LAWS FOR SELLING HANDMADE. It’s written in an easy to understand language and provides step-by-step instructions to get your business up to snuff…legally speaking. and search through the various articles and questions on various subjects. Here’s another site that’s helpful: http://www.craftsandcopyrights.com/index.html Click on “Copyright Info” for a bunch of FAQ’s. This website has some interesting information regarding companies who define what can and cannot be done with their patterns, licensed fabric, etc. but don’t actually have any laws backing them. http://www.tabberone.com/index.shtml Click on the “CLICK HERE” link under the “Tabberone’s Trademark Page” title. Great info. and topics to consider! Thanks for the links !